Card sizes are determined by Row and Column combinations, Paper size, Page Orientation and Margin settings to divide the page evenly. Card Size + Page Setup tab, choose your paper size and page orientation and click the 'Rows' or 'Cols' dropdown twice (to select it), then with mouse pointer over top, roll the mouse-wheel to see the item sizes change as you select different Row and Column combinations. The Margin Drop-Downs increase or decrease the top and bottom margins (↕), and left and right margins (↔) of the page (in pixels). This slightly alters individual card sizes for each Page Layout. 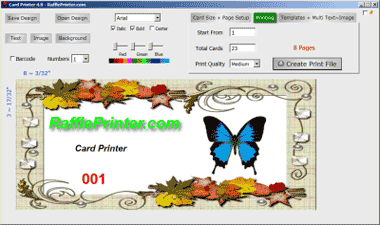 Printed card dimensions are displayed in the designer as you alter margins and a page graphic with margins and item layout is displayed. You can adjust horizontal ↔ and vertical ↕ Margins to get exact sizes if necessary. Mouse over the Margin Drop-downs and roll your mouse-wheel to see the sizes, margins and page layout change. Mouse over Margin labels for exact dimensions, and mouse over the Page Layout graphic for detailed item and margin dimensions in Metric or Imperial. You can fine tune margins to fit pre-perforated paper. If you use common pre-perforated paper, let me know paper size, Rows, Columns and Margins that suit and I'll add it to the 'Pre-Sets' templates drop-down. For specific card dimensions, use these (Imperial and Metric) Calculators to find Row and Column entry and Margin ↔ and Margin ↕ entries. 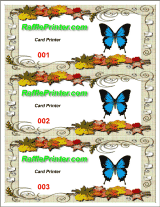 Select page orientation (Portrait or Landscape) and paper size, and select or enter desired card width and height to calculate the entries needed to set the designer to correct size. Just select the Row_Column result and Margin ↔ and Margin ↕ results in the designer (with matching paper size and page orientation). Try swapping between Portrait and Landscape to maximize the number of items per page. Letter 215.9 x 279.4 8.5" x 11"
Legal 215.9 x 356.6 8.5" x 14"
A5 148 x 210 5.8" x 8.3"
A4 210 x 297 8.27" x 11.7"
A3 297 x 420 11.7" x 16.5"
A2 420 x 594 16.5" x 23.4"
A1 594 x 841 23.4" x 33.1"
A0 841 x 1189 33.1" x 46.8"
When you select a larger Card size, all current content will remain in place. Selecting a smaller size gives options to clear all content or auto re-position content inside the new size. If you can't get your printer to exactly align the printed output on the paper, you can adjust the printed page layout left or right and up or down in the print file itself. Click the Margin ↔ or Margin ↕ labels to enter ↔ alignment (left - right) or ↕ alignment (up - down) between -30 and +30 pixels. If entered adjustment is more than Margin (↔ and ↕) the printed area will be on the edge of the page.